Portugal striker Cristiano Ronaldo was forced off injured after just 25 minutes of the Euro 2016 final against France. Ronaldo, 31, was injured in a collision with Dimitri Payet in the ninth minute and Marca says that the Real Madrid star suffered a grade 1 anterior cruciate ligament sprain in his left knee. The Real Madrid forward went down in pain after an apparent clash of knees and needed treatment, but he initially seemed able to continue. 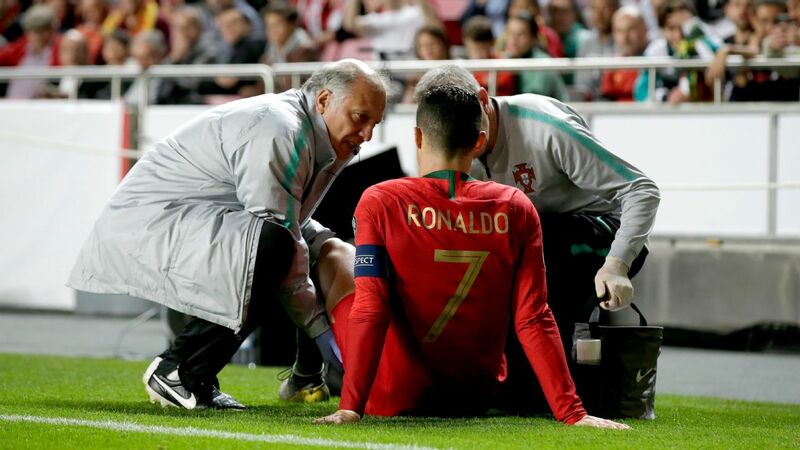 Ronaldo played in discomfort before sinking to the ground again in tears in the 17th minute, leaving the pitch for more treatment as the medical staff made one last attempt to revive him. He was off the field for three minutes before jogging back into the action to jeers from the home crowd. But Ronaldo's game was finally over in the 25th minute, when he again slumped to the ground, and the captain's armband was passed to Nani. On came the stretcher while Ricardo Quaresma came off the bench with the game tied 0-0. Portugal went on to win the game 1-0 after extra time, with a goal from Eder in the 109th minute, and Marca reports that Ronaldo is now in doubt for Real Madrid's first official match next season (the Supercopa on Aug. 9). "Unfortunately, things didn't go well for me. I injured myself in the first few minutes. But I've always believed in these players. They have quality and ability, along with our coach's strategy to win," Ronaldo said after the game. Coach Fernando Santos said at his prematch news conference that he does not believe Ronaldo will retire from international football after the game. Ronaldo equalled Michel Platini's record as the all-time European Championship top scorer after netting his ninth against Wales in Portugal's 2-0 Euro 2016 semifinals victory on Thursday. Cristiano Ronaldo goes down injured against France. He had already become the first player to score in four different European Championship tournaments. Ronaldo has scored in the 2004, 2008, 2012 and 2016 editions, and he also overtook Nuno Gomes as scorer of the most Euro goals in Portuguese history. He has also played more games at the Euros than any other player, setting the record with his 17th appearance against Hungary -- the final was his 21st match. Ronaldo is also the first player to reach three European Championship semifinals.